When I think back to my childhood and the time spent in my school years, one of the fondest memories that comes rushing back are those days in which we rocked up to P.E. as the last lesson of the day and the teachers simply couldn’t be bothered. Why? Well because that would mean only one thing – “turn the benches over guys, it’s time to play Dodgeball!” In gaming however, dodgeball is something that’s never really been utilised much. It wasn’t until three years ago when Robot Roller-Derby Disco Dodgeball arrived that we really saw any real attempt to bring that thrill of diving away from a ball as it misses that gut shot by centimetres to the virtual world. If anyone is going to try once more to get dodgeball into the spotlight however, then it’s going to be the guys behind that very title – this time however they have arrived with a much snappier title, Disco Dodgeball – REMIX. If you’re a fan of party games, then chances are this is going to be the party game you’ve been waiting for. 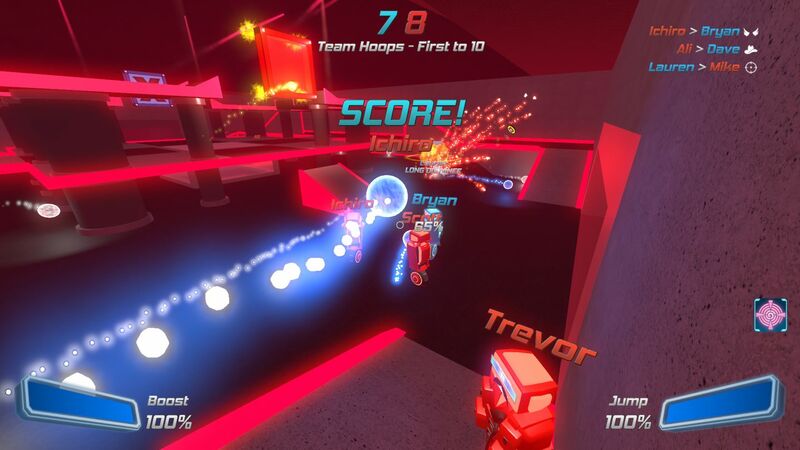 Disco Dodgeball – REMIX is a first-person experience that sees up to eight players battle it out in bright neon-coloured arenas as they fight for the chosen objective… of which there are 21 game modes to get stuck into. Of course, as the title suggests, the game is entirely focused on the sport (yes it’s a sport) of dodgeball, although there is one game mode Kart Race that doesn’t use any balls at all and just requires your one-wheeled robotic fellas to race through a bunch of checkpoints. So, with 21 game modes, it’s fair to say that there are too many to give a detailed analysis of every single one, but that doesn’t mean that any of them deserve ignoring. 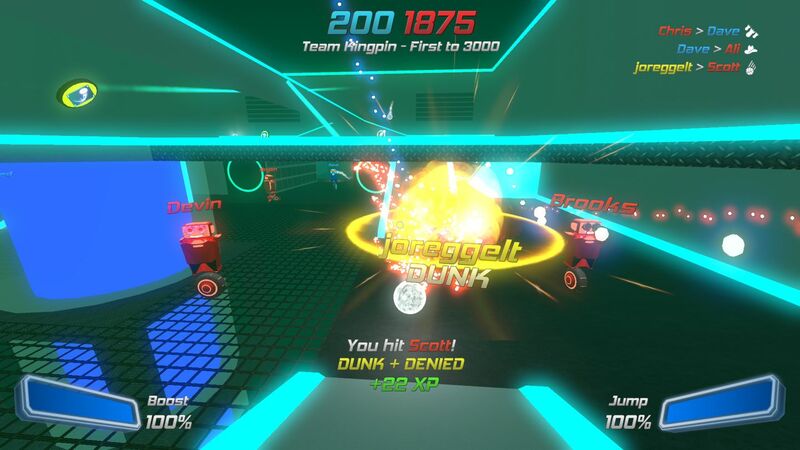 To break it down a bit though, there are four main ways to get stuck in to Disco Dodgeball – REMIX. First up is Training, which teaches players the basics of the game, and is well worth getting used to should you wish to play on the higher difficulties for a real challenge. From there we have the Arcade, which takes players through various levels/missions of increasing difficulty, with a set number of lives, whilst also allowing players to earn money from their performance in order to buy perks and improve characters. The end goal is to become the president of the galaxy – that’s the best you’ll get for a story mode in this one. Challenges are next, and here players can choose from eight different modes, all of which are highly varied and offer a real challenge besides that of a standard dodgeball game. Personal favourites here are Fugitive, which requires you to grab the Super Ball and survive for as long as possible, Duck Hunter which asks for long-distance KO’s to score points, and Pinball in which players earn points by scoring Ricochet shots off the walls. These are just a few of the many challenges available and whilst the overall premise of each mode may sound rather simplistic on paper, actually getting the job done takes a lot more skill than you will probably be prepared for, making for some intense gameplay, especially when looking for the winning point. The final option is that of Bot Match. 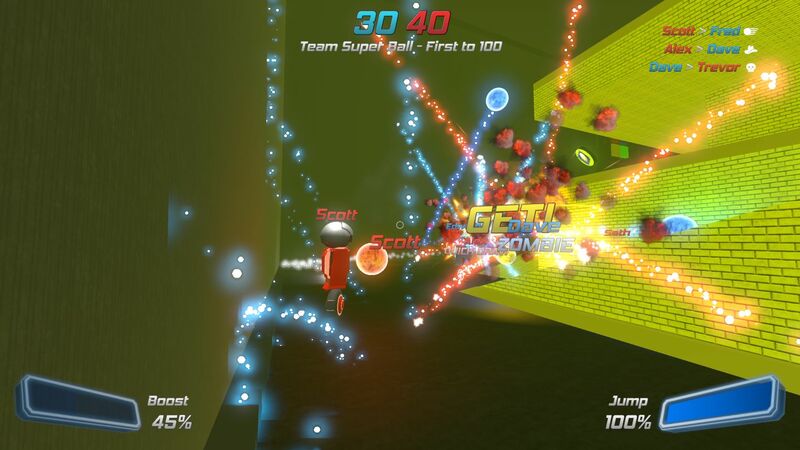 Whilst the idea of Disco Dodgeball – REMIX is to play online, the reality is that as a smaller indie title, it’s unlikely to have many players hitting the servers for too long. The option to jump into a game and adjust the AI numbers and difficulty ensures that not only can every single one of the 21 game modes be enjoyed, but you’ll never have an empty game. 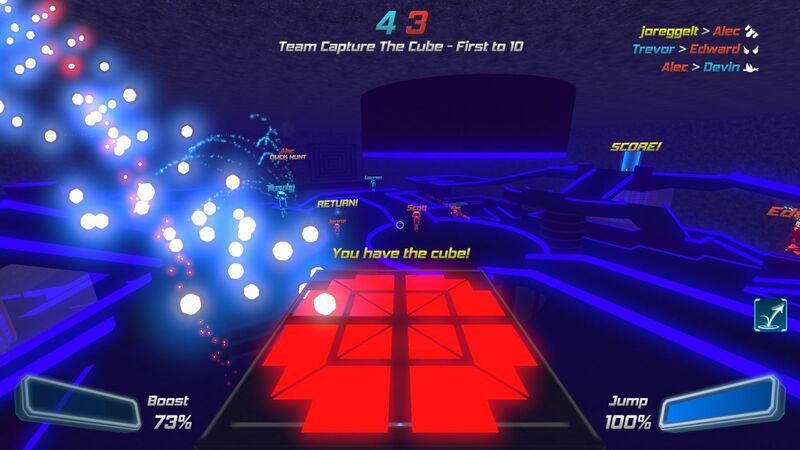 In Bot Match, players can choose from any of the modes, including all of the Challenge Modes, any of the seven Classic Modes that include Deathmatch, the basketball variant, Hoops, Super Ball which tasks you with keeping the ball to gain points, or Elimination (no respawns and last man standing), just to name a few. Those with a little more talent meanwhile might want to head into any of the Expert Game Modes, each of which bring an added twist to the game. Here we see the likes of Elimination Hoops (score points by scoring hoops or eliminating opponents), Galaxy Jam (score hoops while using Jetpacks and Pogo Jump powerups), Hoop Defense (one team tries to score hoops whilst the other stops them for sixty seconds), and Hunter vs Hunted which is a minute long game which pits one team the goal of surviving and the other team the goal of taking them out. No matter what mode you choose – as long as it’s one in which you actually use the dodgeballs that is – every match starts the same way. You begin in an arena and after the countdown you should be looking to rush to one of the randomly generated balls that appear, before launching it at the opposition, with the power of your shot dictated by how long you press the right trigger. Despite the game having multiple game modes, it’s fair to say that the general idea is still pretty simple – it’s dodgeball most of the time with a quirky variation. What is great though is that this is dodgeball at its finest, and it’s surprisingly just as enjoyable in a virtual setting. What makes thing even better though are just how fluid and responsive the controls and gameplay itself are. Even the Powerups such as Pogo Jump, Jetpack, Huge Ball, etc feel like a sensible addition to the game, whilst the modifiers help to bring a change of pace to each and every game with things like High or Low Gravity, Glow in the Dark, Super Bouncy Balls and so on, all decent additions. As mentioned before, Disco Dodgeball – REMIX is designed with online play in mind. Unfortunately, the online population isn’t exactly overflowing with players, however with a server that pretty much covers the entire globe, there is always likely to be an opponent or two – and if you can’t find one, then you can always use the AI bots to fill in the gaps. The online multiplayer plays out the same as the single player options too, with the only difference that you’ll be facing off against real players, something which will probably feel a tad easier should you have been battling it out on the Hard difficulty. If you’re looking for more of a local thing though then fear not as this cracking little indie hit has local options covered too, although unfortunately it is only limited to two players, with the rest of the teams filled with bots. Nevertheless, it’s still a blast and if you and a friend are ready for some couch co-op madness, then there’s every reason to get stuck in to Disco Dodgeball – REMIX. One last thing to note with Disco Dodgeball – REMIX is that after every game, any experience earned will go towards levelling up, and this in itself brings rewards such as unlocking new customisation items that can be used to make your one-wheeled dodgeball machine stand out from the crowd. Is it needed? Not really, but it is nice to have the option. Disco Dodgeball – REMIX is without a doubt one of 2018’s indie dark horses. With enjoyable gameplay, a ton of game modes, and plenty of fun to be had, there is no doubt that those who decide to jump in will head back time and time again to get in on some dodgeball action, especially given how rare these games are on the console platform.